You probably don’t take the time to inspect every package that’s delivered to your home or office – but you should. Especially since the package delivery people so often seem to be big balls of aggression who are just waiting for a chance to smash those sweet new Super Mario Bros beer steins you just ordered online. 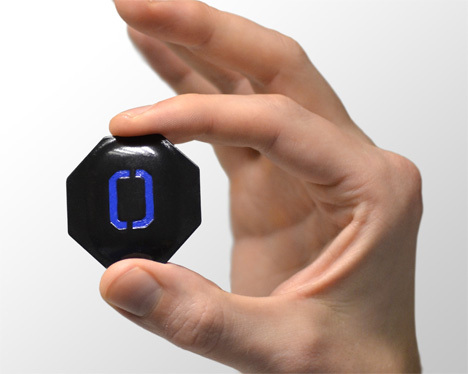 DropTag is a simple device meant to put your mind at ease whenever you get a package delivered. It works with Bluetooth Low Energy and keeps track of whether (or how many times) the parcel was dropped en route to you. The small electronic tag is attached to the package before it leaves the sender, and when it gets to its destination you only have to check the count via a special smartphone app. If it has been dropped, you know that you’d better open up the package to check the contents. 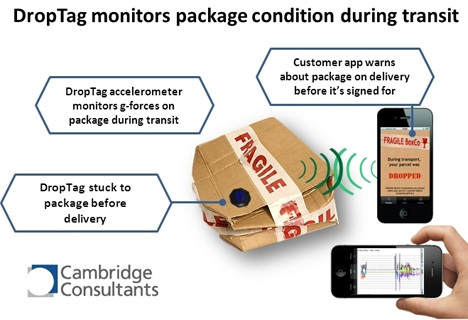 Cambridge Consultants, the firm developing the DropTag, is working on functionality that will allow the tag to record the exact days and times of any parcel drops. The tags will probably cost around $2 each and may even be reusable. In any case, the tag’s battery will last for several weeks, no doubt allowing ample time for packages to reach any location on Earth.